You are currently browsing the tag archive for the ‘Kilnaboy’ tag. On Saturday 16th October we’ll be having a benefit gig at Six Feet Under nightclub in Newport, tickets will soon be available on their website and in local record shops. The Oppressed are the world’s foremost anti-fascist skinhead band; formed in Cardiff in 1981 they have been speaking out against racism in a scene where too many have kept quiet. Responsible for bringing “SkinHeads Against Racial Prejudice” (SHARP) to Europe over twenty years ago and still active in anti-fascist organising with Cardiff Independent Antifa. Though the band now regularly play events across Europe, local gigs are few and far between, this will probably be your only chance to see The Oppressed anywhere near South Wales this year. Not to be missed. Support comes from other outspoken Cardiff punk and skinhead bands. No Choice are one of the best UK punk bands formed in the early 80s that are still recording and along with anarcho-folk-punx KilAboy have been regulars at No Borders benefit gigs for years. Tighten Up are a 60s skinhead review group and The D Teez are “just another punk band” both featuring members of the Oppressed. 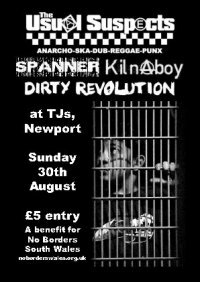 On Sunday 30th August we’ll be having a fundraising event in TJs, Newport. For a modest entry fee of £5, you can feast on a delight of rabble rousing rebel music. Over on tour from Belgium are dub/ska-punk band The Usual Suspects who bring militant politics to music in a manner that can only be matched by Spanner who are coming over from Bristol. 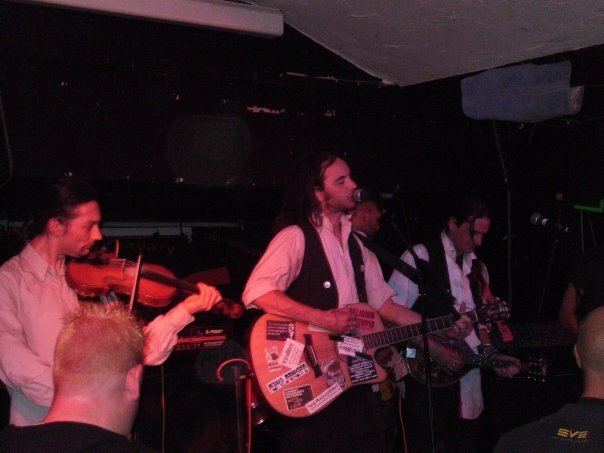 They are joined by Cardiff revolutionaries KilnAboy and Dirty Revolution who bring folk-punk and reggae-punk respectively. There are event pages on both facebook and myspace, please help us promote this event by inviting your friends! On the night you’ll be able to find us activists taking turns behind our usual stall, it would be good to meet anyone who is interested in finding out more or getting involved.